Solid Carbide Compression Spiral Router Bit. For cutting composite material with double-sided laminate, producing a clean finish top and bottom. For flat table machines, choose a short upshear. Tools shown are RH rotation. LH rotation is available upon request. Solid Carbide Compression Spiral Router Bit. 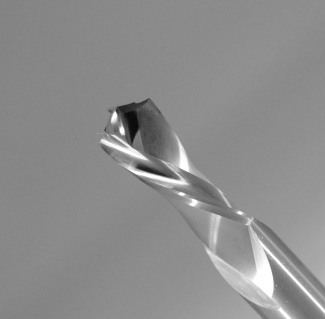 Our long-life version is designed for composite materials and provides a longer tool life. The carbide grade used for this bit features a lower cobalt content than standard grade. Tools shown are RH rotation. LH rotation is available upon request. Solid Carbide Compression Spiral Router Bit. Tools shown are RH rotation. LH rotation is available upon request.